It'll be a lone actor on an empty stage, a cellist and an audience in prison across the state of Oregon. Those are the elements for multiple performances of "An Iliad," produced and directed by Milwaukie resident Patrick Walsh. He and his two performers will stage the play starting Oct. 2 at the Oregon State Penitentiary in Salem. They will visit nine other prisons, ending Oct. 27 at Sutter Creek Correctional Institution in North Bend. "An Iliad" is about "a weary, ancient Poet who travels endlessly across time to relate the story of the Trojan War to audiences, hoping they will learn from their ancestors' mistakes," Walsh says. He has loved the play, written by Lisa Peterson and Denis O'Hare, since he read it six years ago. "I'm really obsessed with ancient Greek storytelling and how every theatrical advancement that has been made since that time is deeply rooted in those traditions," he says. "What this play is about is how every society since the Trojan War has an immense attraction to rage and violence. The end of the play seems to ask how we can break this never-ending cycle both in ourselves and in our communities," Walsh said. Walsh has directed and produced plays with all the major theater companies in Portland, and he also has worked at Two Rivers Correctional Facility in Umatilla, where he volunteers through the Arts in Prison program. It is through his work in correctional facilities for the past four years that made him realize that the men incarcerated there have an intense interest in answering those questions about rage and violence. "I'm hoping that the performance will serve as a catalyst for discussion about the attraction to violence that our society seems to have. I'm also hoping that during the 90 minutes of the performance that the audience forgets they're in prison," he said. 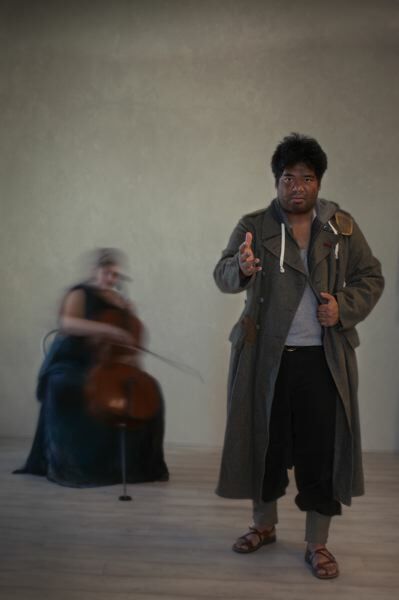 Paul Susi will play the role of the Poet in "An Iliad," while Anna Fritz will play the cello. "Paul has incredible technique, openness and empathy," Walsh said, noting that this will be their third project together. "He's one of the kindest people I know, and his heart just bursts for every living being. He is going to turn each one of those facilities we perform in into a community." Walsh has never worked with Fritz before, and said he was lucky to find someone so smart, talented and kind for this project. "To me the cello has such a range of emotions in it. When you hear a cello you immediately understand sadness, happiness and vulnerability," he said. "All of the notes feel brand-new and 10,000 years old at the same time. ... I'll guarantee that most of our audience has never heard a live cello before. It's going to be a truly magical experience for our audience members." Walsh added that it feels like the perfect time to be working on this play in our country. "It feels like an amazing way to actually fight the negativity that is swarming around all of us all the time these days," he said. "I'm also excited to be bringing art to some of the members of our society who have the least access to it. I know without a shadow of a doubt that these are the people who benefit the most from it." Like Walsh, Susi has worked with most of the theater groups in Portland for years. He also is the executive and artistic director of Portland Actors Ensemble / Shakespeare in the Parks, serves as a manager for Transition Projects' emergency homeless shelters in downtown Portland, and is a program leader and assistant site supervisor for the Multnomah Education Service District Outdoor School. He also has worked as a counselor and an educator at several Portland nonprofit organizations serving homeless, recovering, post-incarcerated and adjudicated populations. He said he wanted to be part of "An Iliad" because of his love of the classics, but also because he believes "that culture and performance demands access to all audiences, not just the privileged." All audiences, he said, "benefit from being in communion with an art form that is both eternal and ephemeral." "An Iliad" focuses on "the experience of profound trauma and its repercussions on the psyche that perpetrates/survives such trauma, and in this way it speaks to our current and constant experience of violence, war, loss and suffering," Susi said. As for how he feels about working in a prison setting, Susi noted that he is familiar with the protocols and expectations of prison settings. But on an emotional level, he knows he will be "impacted by the pervasive atmosphere of coercion, authority and latent violence throughout." He hopes the inmates "feel a recognition of our common humanity, and that from this exchange of empathy and emotional truth, we all discover hidden insights, grace and wisdom within ourselves as a result." Susi thinks that a play like "An Iliad" can "liberate us from the need for heroes, once we see how the true struggle, the real sacrifice that requires the most courage, strength and integrity, is in when we face ourselves, and hold ourselves accountable." He added, "This is what I hope to convey in this performance, and why we're focusing on this audience." Fritz is a Portland-based cellist, singer and songwriter, whose cello work can be heard on more than 50 albums, including releases from The Decemberists, My Morning Jacket, Dirty Projectors and First Aid Kit. She is a founding member of Portland Cello Project and toured with the band for seven years. She also has maintained a studio of cello students in Southeast Portland since 2007. This will be her first time performing in a correctional institute and said it feels like an incredible opportunity for her. (This is) "a way to use the unique tools I have to be of service to fellow humans who have been stigmatized ... and to be changed myself by connecting with them through art," she said. "It is a horrifying reflection of the dysfunction in our society that we warehouse and forget so many people in prisons," Fritz says. The way to change that situation is to recognize their humanity, she said, adding, "Theater and music are essential parts of being human, and they are powerful tools for connection and healing." Fritz has been working on an original score for the music in collaboration with Walsh. 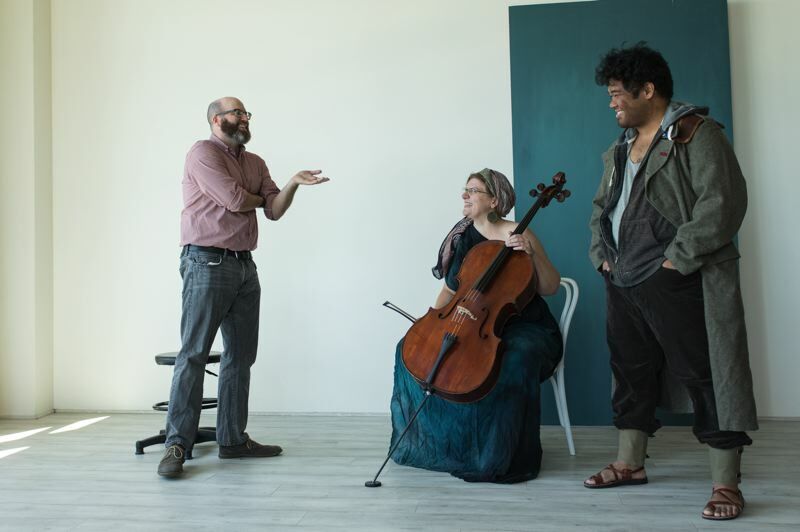 "I appreciate that he wants the music to have the mark of my particular voice as a composer and a person, and we're exploring how the cello can be another actor on the stage, integral to the telling of the story," she said. Fritz knows that the prison environment will be challenging for her, and has some wariness about going into all-male facilities. "I actually intend to meet regularly with a support committee of people from my Quaker meeting throughout the course of the production. In addition to helping me process my experiences, I imagine this will have the effect of amplifying the project's impact in a wider community," Fritz said. She hopes that experiencing this play will help the inmates feel seen and valued. "I also hope the talkbacks after performances can be a space for real connection and sharing." Throughout the month of October, the performers will travel to: the Oregon State Penitentiary, Warner Creek Correctional Facility, Columbia River Correctional Institution, Two Rivers Correctional Institution, Eastern Oregon Correctional Institution, MacLaren Youth Correctional Facility, Oregon State Correctional Facility, Shutter Creek Correctional Institution, the Federal Correctional Institution at Sheridan and Coffee Creek Correctional in Wilsonville.